“Innovation” is far more than just a term that’s being bandied about by industry and marketing mavens and actors... “Innovation” is an agency of change, of solidifying dreams into a reality, of bringing the future into today. Innovation is also an action... Satellite Innovation (satinnovation.com) drives technology into areas never before realized, where a look ahead becomes a current possibility, where a cognizant thought can be cemented into a positive enhancement for satellite and space market segments to the delight of users, companies, organizations, nations, agencies, militaries, and students. With innovations for the space and satellite market segments increasing in scope, with more and more deliverables arriving on market that possess heretofore “impossible” and now amazing technical capabilities, there are an ever increasing number of eyes and dollars attuned to the “how to” monetize this arena than has ever been witnessed before in the history of the space and satellite industry. Every few days, it seems as though another space startup emerges, with the hopes of fitting and satisfying a niche that will be a successful part of this explosive market. For years, experts have been questioning what market segment the world’s first trillionaire will emerge from to step onto the world stage — with the potential that the space industry offers, most major venture capital firms are eying this industry as the segment that will see this occur. Satellite communication (SATCOM) is the basis for most of the revenue for current, privatized space. Satellite Innovation is focused on the business of satellite communications, and the leaders and innovators participating in this event will be focused on exactly where the next growth segments are likely to develop and will also accurately determine business potentials with realistic timelines. Attendees will become participants in the future... today. One of the company executives who will be participating as a speaker at Satellite Innovation is the CEO of Eutelsat Americas (www.eutelsatamericas.com/), Mr. Mike Antonovich. He will be addressing attendees at the “New End User Markets — The Next Generation of Satellite Customer” session, which is being held at 2:30 p.m. on Tuesday, October 9. The session will point out that, with broadband services costing more than $2 per megabit/second per month, and fiber or cable being less than $1, new point to multi-point services may be the next market. With vertical integration disrupting the established marketplace at an increasing pace, new users will provide an opportunity for growth and for service providers and operators alike, a means of survival. This panel aims to identify important strategies to secure new markets which will be of significant importance to all satellite industry players in the future. Techniques to identity new partnerships, how to connect with new customers and an emphasis on the unique advantages of SATCOM over alternative technology will be discussed. 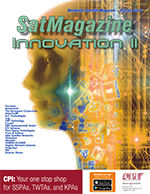 SatMagazine queried Mr. Antonovich as to his thoughts regarding why is innovation important to the industry and, in particular, to Eutelsat Americas? Mike replied, “Innovation has been a cornerstone of Eutelsat’s success through the years. The company has always embraced new technologies to improve satellite performance and reliability for our customers. One domain where Eutelsat has been a leader is in the design of all-electric satellites, which allows for improved service life for our spacecraft, reduced fuel mass and more efficient payloads for our satellite deployments. EUTELSAT 115 West B was actually the world’s first all-electric satellite. “Looking at in-flight connectivity, EUTELSAT 172B has also been iconic for this market, due to its innovative High Throughput Ku-band payload designed for in-flight broadband with multiple user spots optimized to serve densely-used Asian and trans-Pacific flight paths. When talking about the innovative projects Eutelsat have underway, Mike said, “For starters the new EUTELSAT QUANTUM satellite will be the first to feature the unique ability to change uplink and downlink coverage on orbit, via software, allowing customers to use satellite bandwidth and power with far greater flexibility than ever before. “Moving closer to the ground, we are developing a entire range of new video solutions under the Eutelsat CIRRUS brand name. Eutelsat CIRRUS provides a turnkey content delivery solution via satellite and OTT to operators seeking to launch or upgrade their service, offering the benefits of rapidly deployed video services, low operational costs, high image quality and consistent end-user experience. It will improve the workflow and efficiency of video transport across the wide spectrum of Eutelsat video customers. “Finally, taking advantage of satellite’s unique ‘one to many’ and ‘any to any’ capabilities, we are developing Internet Of Things solutions using our SmartLNB, designing cutting-edge offers to enable real-time live communication with thousands, tens of thousands and potentially millions of low cost devices and appliances to relay information to and from virtually anything.